If one is to pinpoint a single sector that has performed exceptionally well in Sri Lanka in recent years, it would be the tourism sector. Tourism earnings have grown from a paltry $ 350 m in 2009 (during the height of war) to $ 2.4 b by 2014. The growth has continued thereafter as well to reach $ 4.4 b in 2018. Sri Lanka’s number one foreign exchange earner, worker remittances, which grew rapidly up to $ 7 b in 2014 on the back of the global commodity boom and high crude oil prices which buoyed middle eastern economies, has stagnated since then at $ 7 b in 2018. 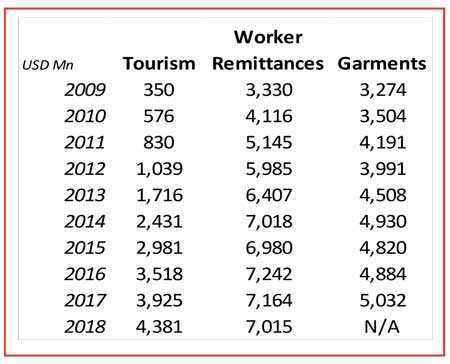 The other main foreign exchange earner, garments, is also stagnating around $ 5 b since 2014, which underlines the significance of the performance of the tourism sector. The other key foreign exchange earners such as tea, rubber and IT/knowledge services are at well under $ 2 b still. The growth in tourism is not surprising as Sri Lanka’s clearest and easily exploitable competitive advantage is its natural beauty and the diverse attractions in close proximity. The ending of war resulted in a secure environment which effectively opened the gate to Sri Lanka for global tourists. Understandably, most foreign investments and FDIs to Sri Lanka since the ending of war have been to this sector. The importance of this sector to the economy is even more pronounced when one considers the distribution of earnings. It is not confined to a smaller group of large enterprises or investors. While it has created thousands of jobs for locals, it has also created a vibrant small – medium sized industry consisting of local investors through home stays, Airbnb, etc. In fact, some of the larger hotels have not witnessed a rapid rise in earnings in recent years due to the competition posed by these smaller entities. Encouragingly, the small restaurants in Hikkaduwa or Unawatuna operated by locals are almost entirely patronised by European tourists during the tourist season and the quality and service levels are surprisingly high. Sri Lankan food has become a key tourist attraction due to the innovations of these small scale operators! While the performance so far is heartening, it is relevant to ask what the target should be in the foreseeable future. While Sri Lanka attracts less than 2.4 m tourists and earnings of $ 4.4 b annually, Singapore which is much smaller in size, attracts over 15 m tourists and earnings of around $ 25 b. Therefore a target of 10 m tourists and earnings of $ 15 b p.a. in seven to eight years (say 2026) should be a possibility. What should be done to make that happen? In the writer’s view, there are two main factors that need to be accomplished: Improve the tourist attractions and expand the airport. As for developing tourist attractions, Singapore is a great example. Despite the lack of natural resources or attractions, they have developed each insignificant attraction into significance by uniquely developing each product. 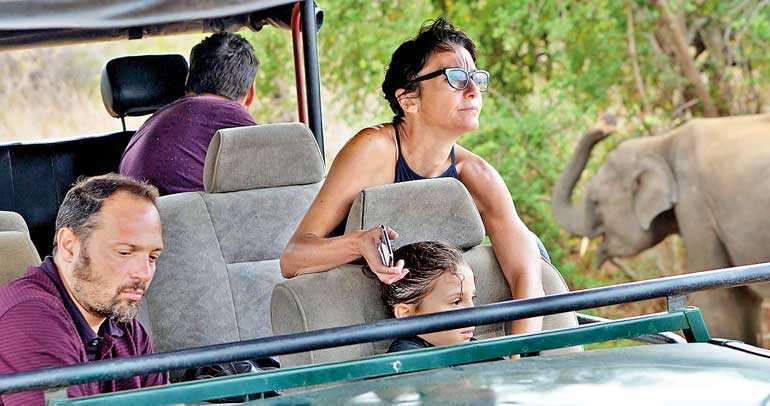 The relatively small zoo which is converted to an innovative “night safari” is a case in point. In fact, the Changi Airport itself is a tourist attraction and worth a visit to Singapore. In that light, Sri Lanka should do so much more with each product: southern and eastern beaches, wild life parks (Yala, Wilpattu), Sigiriya and other ancient sites such as Anuradhapura, Polonnaruwa, whale watching, Elephant Orphanage, hiking experiences in Horton Plains and Ella, etc. Each of these attractions should be uniquely developed with focus on beauty, cleanliness, and safety which would enhance the attractiveness. This would be a worthwhile investment by the Government considering the potential to increase tourism earnings well beyond the entire merchandise exports (of less than $ 12 b) in 2018. The Changi Airport in Singapore (which is being expanded to handle 85 m passengers) handled over 60 m passengers in 2017, out of which over 15 m were tourists. While Colombo Airport is said to have a capacity of six m passengers p.a., it is handling around 10 m passengers currently (including 2.4 million tourists). The Mattala Airport has a capacity of one m passengers p.a. Therefore to accommodate 10 m tourists, the Colombo Airport needs to be expanded at least by 200% or towards a capacity of 20 m passengers p.a. (from the current level of six m) or even more. Subsequently, even Mattala Airport may have to be expanded towards a capacity of five m passengers. Once again, these would be worthwhile immediate investments from the part of the Government considering the potential earnings in the future. The healthcare sector is a relatively developed sector in Sri Lanka predominantly due to the high skilled labour. It is well known that arguably the smartest in the country enter the medical colleges every year through a stiff competitive process. Hence this talent should be exploited to earn foreign earnings by attracting foreigners for healthcare services (currently the smartest portion of the workforce is not contributing directly to attract foreign earnings). While the Government need not do much in this segment, it could provide incentives to attract private and foreign investors to set up hospitals predominantly targeting tourists. Apart from boosting tourist arrivals, this could be a way of retaining the high skilled medical professionals in the country by providing extra income. Regulations should be eased by the Government so that work times are made flexible and the skilled staff could be employed in these private hospitals on a part time basis. Further, this could trigger a reverse brain drain by attracting the skilled labour who has emigrated to developed countries and also facilitate an increase in intake of medical professionals annually with the increase in demand. Despite the clear upside in the tourism sector (the low-hanging fruit really), the country has potential to develop in other sophisticated sectors such as technology and knowledge based industries. The status of a country depends more on the advancement in technological sectors rather than how financially rich the country is. Despite the high per capita GDP, tourism dependent countries such as Macau (gambling capital of the world) and Brunei have less of a reputation in world stage compared to technologically advanced countries such as Taiwan or Hong Kong. Sri Lanka should go down the lane of the latter than the former.